You might expect there to be a catch, and you'd be right. After all, the feature was previously tied to a subscription, and companies don't like to give things away if they can charge for them instead. In this case, the lone "gotcha" is that content owners can set their videos to disallow PiP playback. Based on reports, that is the case for many (if not most) music videos. 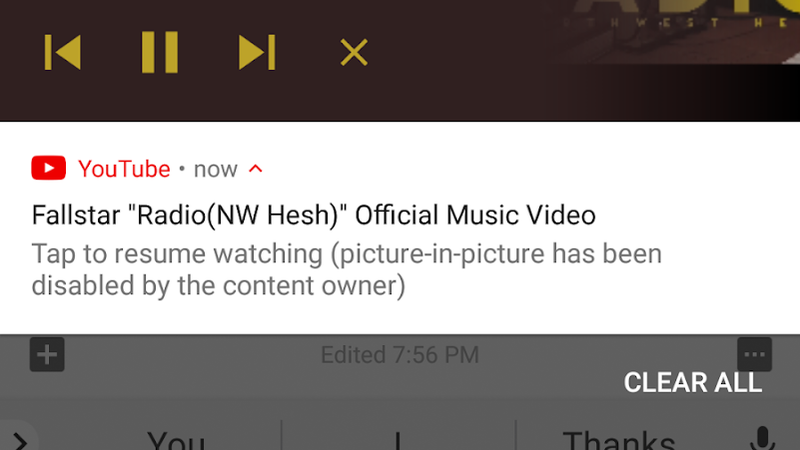 Per-video notification that PiP has been disabled. The test also appears to be limited in size and server-side. One of our tipsters (we ❤ you) reported using YouTube v13.16.55 when they observed the behavior. But in our own testing with that version of the app, we were unable to trigger PiP on a free account. It's a cliché when it comes to Google updates and tests, but YMMV. PiP playback on an account without YouTube Red. There are multiple reports at venues such as Reddit for Red-less PiP, with the new behavior appearing to be live in several countries. As you would expect, you'll need Android 8.0+ to be able to use it, since PiP requires operating system-level support. 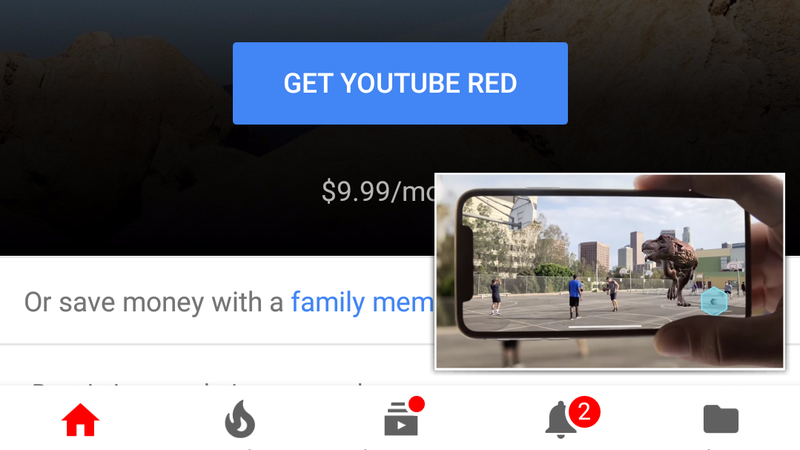 Success isn't guaranteed, but if you'd like to give it a shot, most reports with the information indicate this version of YouTube (or later) may be required. 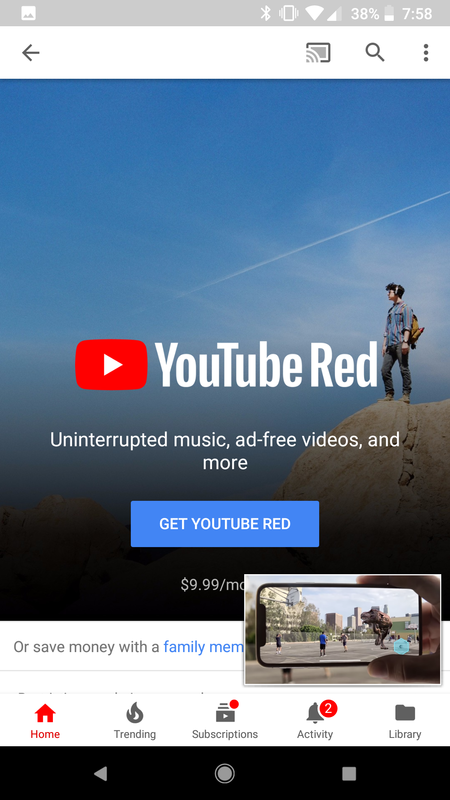 Many more users without any paid subscription (Red/Premium/whatever-you-wanna-call-it) are now able to play non-music YouTube videos as picture-in-picture even when they switch out of the app. However, it seems that this is limited to those in the US only at the moment. Thanks, Michael B, Lewissd, Jordan! Note: Picture-in-picture is currently only available in the U.S. on Android mobile devices running Android version 8.0 Oreo or above. 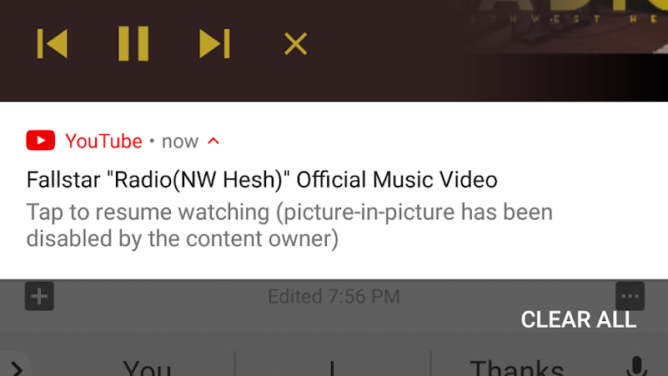 PiP mode for videos that contain music content is only available for YouTube Premium members.